A hub for music giants (U2 and Sinead O’Connor kicked off their careers here), and home to the literary canon, Dublin has long offered a feast for the eyes, ears and mouth. Now it’s a career destination as well. Those looking for job opportunities could join Microsoft’s new state-of-the-art inside sales center in Dublin, where cool events, a globally diverse workforce, and constant innovation and collaboration are the norm. At the Dublin offices, teams work on household-name products like Windows, Azure, Office, and Xbox while gazing outdoors at mountain peaks or the race and golf courses that dot the campus. The recently opened Inside Sales Centre in Dublin is hiring approximately 600 sellers to leverage leading-edge technology tools and analytics. 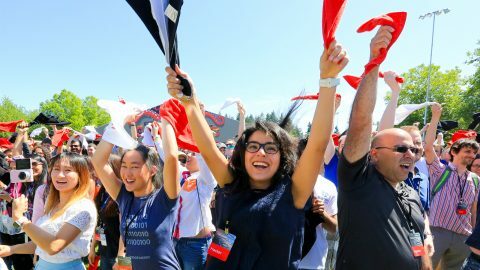 New recruits will join the 1,200 people already working with Microsoft at the Inside Sales Centre, with 500 of the recruits offering support to customers in over 30 different languages. Xavier Chachignon, a solution specialist for Office 365 has found Dublin to be a perfect career fit. Born and raised in Paris, Xavier had worked in different cities across France before accepting a position in Washington DC where he stayed for two years. His international move back to Europe didn’t just introduce him to a new culture. It also allowed him to reside in a city surrounded by tech giants, animated by a stimulating start-up scene, and brimming with an abundance of organized events that allow tech professionals to meet one another. Xavier was already a believer in maintaining an international mindset. Aside from benefitting personally from cultural exchanges in his career, Xavier also believes that it makes for better business. As a seasoned professional at Microsoft, Xavier can offer advice on how to make better use of the cloud, manage devices centrally, deploy security strategies, distribute mobile apps, or design corporate data architectures within SharePoint. But to pinpoint the solution he must first engage in careful listening. The globally diverse workforce is known for their tight teamwork—at work and play. Teams participate at social and charity events, and have opportunities to attend cultural outings together, from Dublin Castle, the National Gallery, and Kilmainham Gaol—a former prison that’s been converted into a museum. Working at Microsoft doesn’t just allow me to build my technical skills within a specific role. It also allows me to think about my next role. At Microsoft I can build a career development plan that allows me to change my current role, move to a different department or even to a Microsoft company in another country.